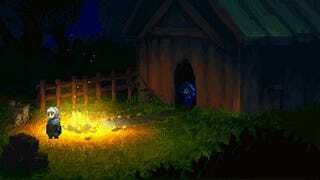 Its creator started working on Platformer/RPG Heart Forth, Alicia in 2007. The result is an aesthetically beautiful game with a complex story, a detailed world and what looks to be pretty damn fun gameplay. Sadly, it's still not done. On top of that, we've got the familiar metroidvania-RPG fare: a large, connected world, steady character progression, loot, side quests, crafting, and so on. There's a little bit of that in the trailer above, if you can notice it while you're gawking at the art. As I mentioned, the game is still unfinished, which is why it was put on Kickstarter—it already managed to collect over $3,000 in just four hours, impressively enough. That's five percent funding. In four hours. I foresee a bright future for this one. Should the campaign succeed, Heart Forth, Alicia is promised to arrive on PC in one year, in May 2015.